Disinfecting water kills coliform bacteria and other disease-causing pathogens. Note: The content on this page has been adapted from publications of World Health Organization (WHO) and Centre for Affordable Water and Sanitation Technology (CAWST). Disinfection by Solar Radiation (SODIS). How Does Chlorine Disinfection Work? Chlorine is a popular chemical used to disinfect drinking water. Sodium hypochlorite and NaDCC, also known as sodium dichloroisocyanurate or sodium troclosene, are different types of chlorine that are available. There are several different brands of chlorine products that have been manufactured specifically for household water treatment. Each product should have instructions explaining how to use it properly. Boiling is considered the world's oldest, most common, and one of the most effective methods for disinfecting water. Pathogens are killed when the temperature reaches 100 degrees Celsius. CAWST recommends boiling water for 1 minute and adding 1 minute per 1000 meters of elevation. 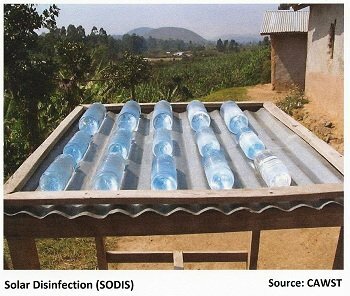 SODIS uses the rays from the sun to kill pathogens in the water. It can be used for disinfecting water in small quantities with low turbidity. Households fill transparent, non-colored plastic bottles made from polyethylene terephthalate (PET) and place them in direct sunlight. Water can be used directly from the bottle to avoid recontamination. Return to "Water Treatment" from "Disinfecting Water"